My boyfriend complains sometimes that there are no good cakes in Holland while in Israel even the simplest prepackaged coffee cake is good, (a serious case of homefood sickness I believe) so I decided to make his favorite supermarket cake at home. Mix the ingredients for the dough together minus the butter. Mix it into a soft and elastic dough for about 7 min and now add the butter. If you have a machine that kneads for you, this is no problem, if you knead by hand like me you better flatten the dough first and put the softened and cubed butter in the center. Close the dough and knead it inside the dough. After a while it will inevitably break out a bit but that is alright, when it becomes to sticky/buttery, just put some more flour on your hands. Don’t lose hope, you will knead it in a beautiful buttery dough. Cover the bowl with cling film and leave it to rise for an hour. Now mix in a bowl the honey, tahini and lemon juice. When well combined keep in the fridge until you need it. Cut the chocolate into little cubes. Flour a clean worktop and work the dough with a rolling pin into a thin rectangle, a little longer than you cake tin. Let’s say you make it 2/3 mm thick. 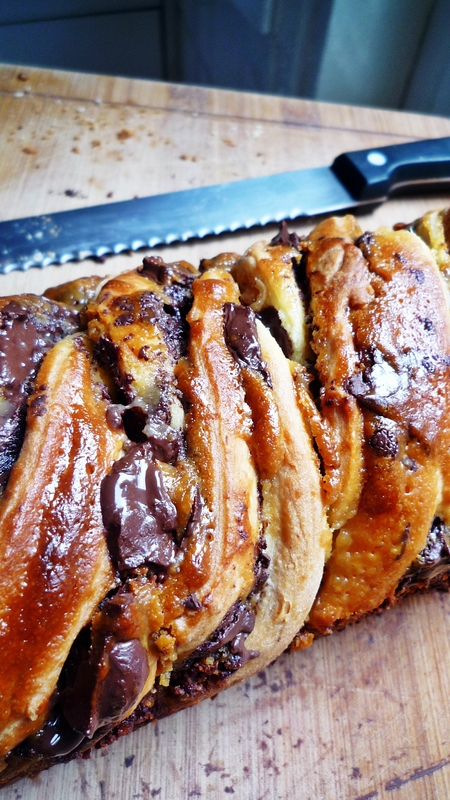 Spread the tahini/honey mixture all over the dough and sprinkle the chocolate on top of it. Roll the dough like a Dutch pancake and you will be left with a long dough sausage with all the mixture inside. Cut the dough sausage lengthwise entirely through. Now swirl the two sides over each other while trying to keep the cut side up. 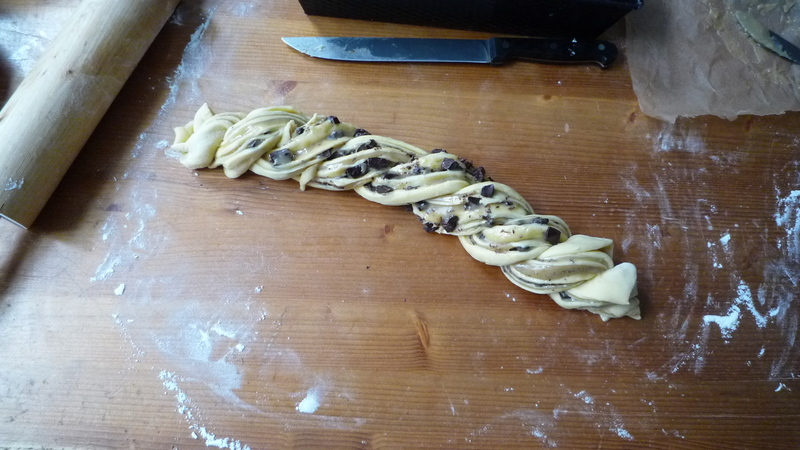 I made about 8 swirls but you should just see how you come out (see the picture if this sounds a bit confusing). Grease a cake tin and put the cake inside, tuck the ends under the cake a bit. Let the cake stand for another hour until almost doubled in size and then bake it in a preheated oven on 180C for 35-40 minutes. It can be nice dark golden brown but if the top gets to dark, cover it with some tin foil. Let it cool down on a cake rack. It’s very nice to eat when it is still a bit warm. 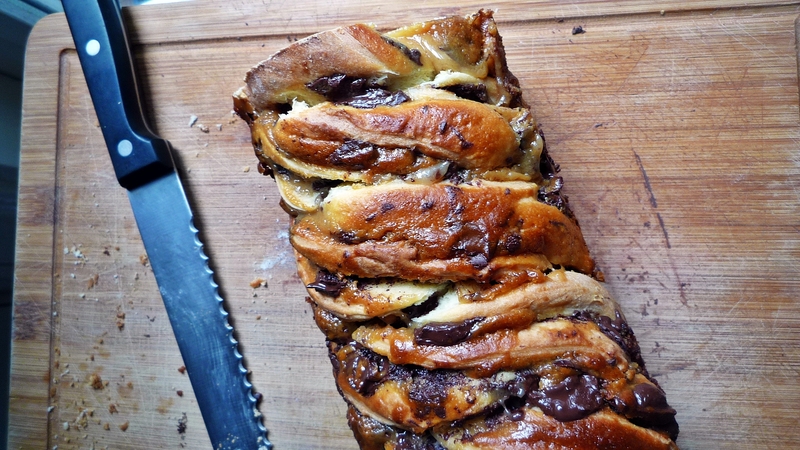 This entry was posted in All, Bread and Cakes and tagged chocolate cake, coffee cake, sweet tahini. Bookmark the permalink. What’s the weight of a packet of vanilla sugar? I make mine in large jars so I don’t know exactly what the quantity refers to. Dear Allie, 1 package of vanilla sugar is 8 grams, at least the ones they sell in Holland. Have fun baking! I love the name of your blog! Don’t worry, I think your boyfriend is just homesick, because many of the packaged cakes here aren’t that great … your version looks wonderful, though! Thank you for the compliment Liz. You’re probably right, also ,things from the childhood do seem to be better and tastier in the memory than they actually were. But he will be able to eat plenty of his favorite Israeli food in October when we visit the country. Hi Janneke – this looks lovely. How many lengthwise cuts did you make before twisting it? After you rolled up the dough you cut it lengthwise just once. You end up with two rods which you can swirl around each other. Be careful the filling won’t spill out. 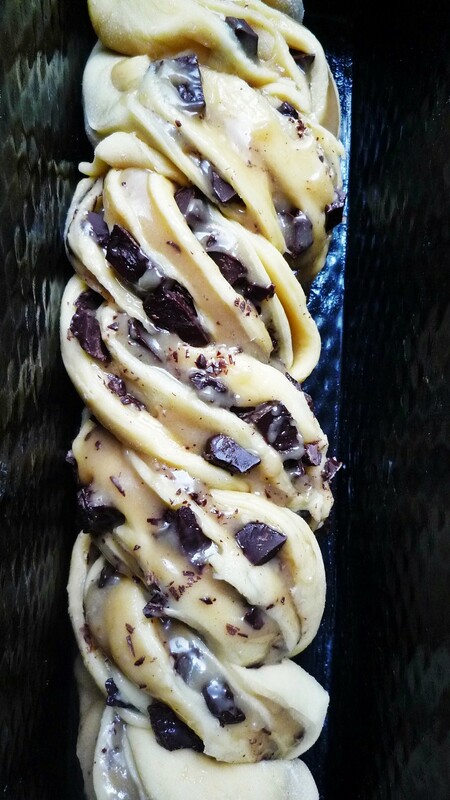 You can see a picture of how it should look like before baking in the end of the recipe. wonderful it is! What about also using puff pastry instead as an alternative may be it needs less preparation. Anyway congrats!